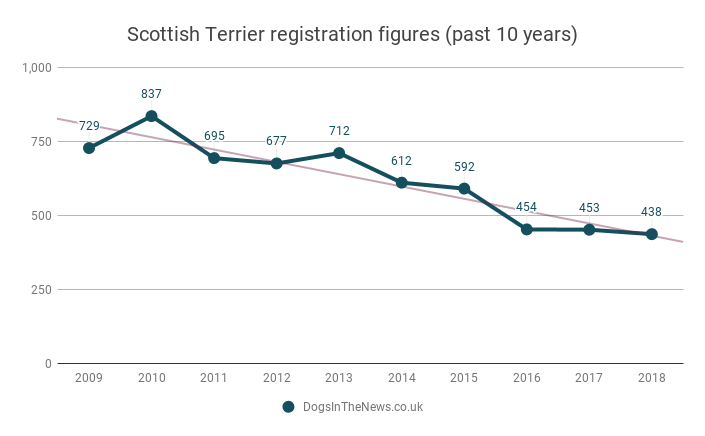 The Scottish Terrier, more famously known as the Scottie dog and as the face of famous brands such as Radley, has entered the Kennel Club’s list of dog breeds ‘At Watch’ because they number fewer than 450 annual puppy registrations. The breed, chosen as one of the iconic Monopoly counter pieces, has declined by 38 percent in the last five years and only 438 dogs were registered with the Kennel Club in 2018, according to new registration statistics released by the dog welfare organisation. 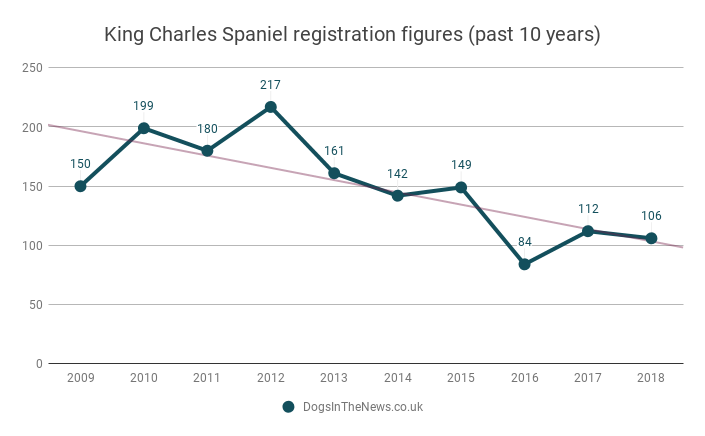 More native British breeds than ever before are at risk as their popularity declines in the face of ever increasing demand for new breeds such as the French Bulldog, which is the inspiration behind the Kennel Club’s #savebritishdogbreeds campaign. The campaign aims to remind people about the 221 breeds of pedigree dog in the country, including those historic native breeds that are at risk of disappearing, as they become forgotten. British and Irish breeds with fewer than 300 puppy registrations per annum are entered onto the Vulnerable Breeds list and those with 300-450 are closely monitored and put on the At Watch list. 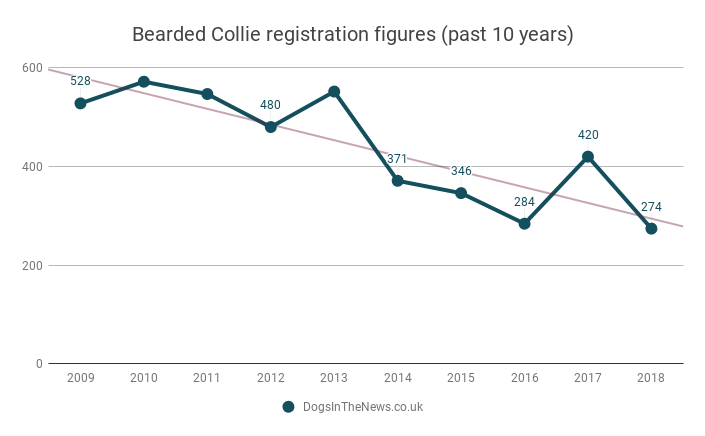 One of Britain’s most iconic dog breeds, the Old English Sheepdog plummeted to its lowest ever level in 2018, and with just 318 registrations – a decline of 17 percent since 2017. 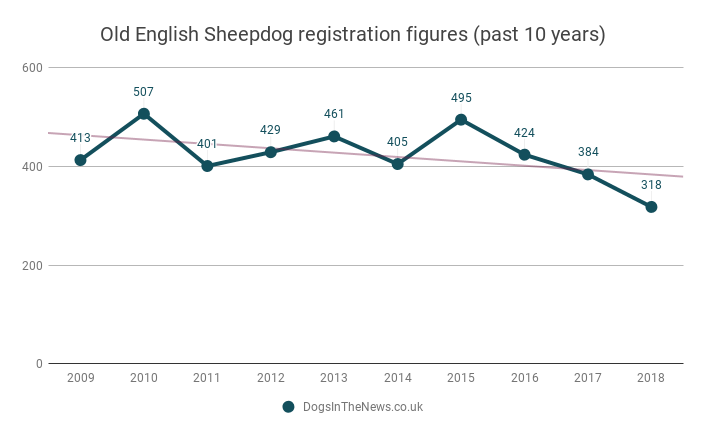 This means the breed, whose status is currently ‘At Watch’, is now 18 registrations away from entering the Vulnerable Breeds list. 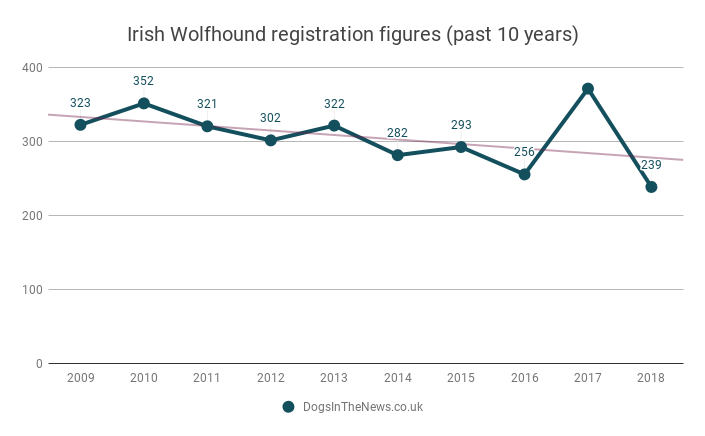 Furthermore, two native dog breeds – the Bearded Collie and Irish Wolfhound – have re-entered the Kennel Club’s list of vulnerable breeds that risk disappearing in the future, after also hitting historic lows of 274 and 239 registrations respectively. The Bearded Collie had almost three times as many registrations when the Kennel Club first began the list in 2004. 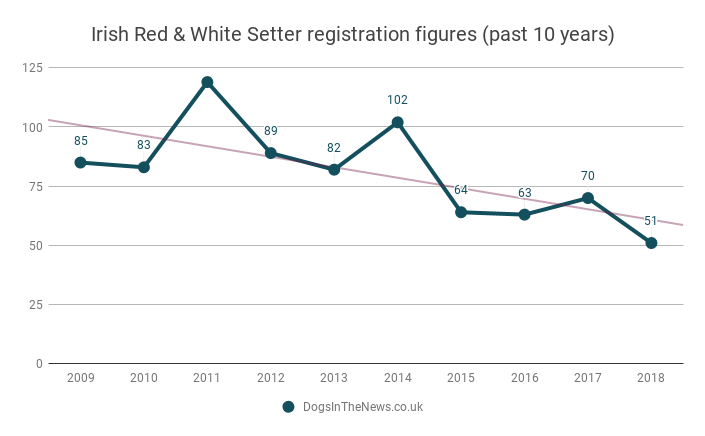 The Irish Red & White Setter is another breed that has reached its lowest level since the list began, with just 51 registrations, prompting the breed club to fear that they will die out. These breeds are experiencing no such decline in popularity in the show ring however, thanks to a small group of enthusiastic people. 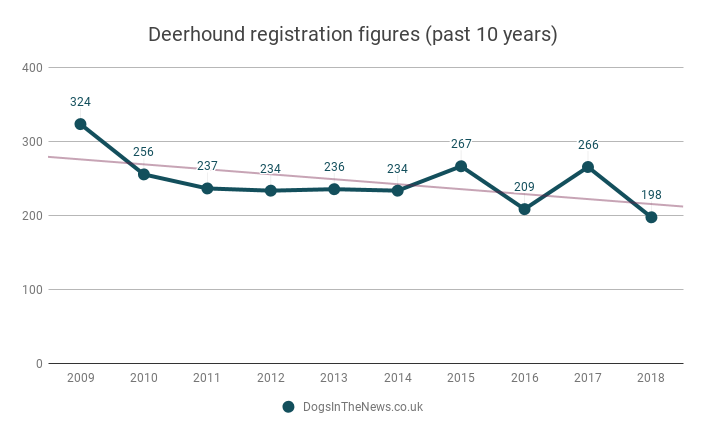 Breeds such as the Deerhound and King Charles Spaniel, both on the vulnerable list, are amongst the top ten breeds to increase in Crufts entry numbers this year. There is hope that Crufts could shine a light on these breeds, which are disappearing from the public mind. Vulnerable breeds will have their own booths at the event, where the public can meet and greet them and they will have their own dedicated competition in the main ring. Til Tovey, Secretary of the Scottish Terrier Club of England, said: “It is so sad to see this wonderful and well-recognised breed, which is affectionate, loyal and intelligent, steadily decline in popularity as more fashionable choices take over. 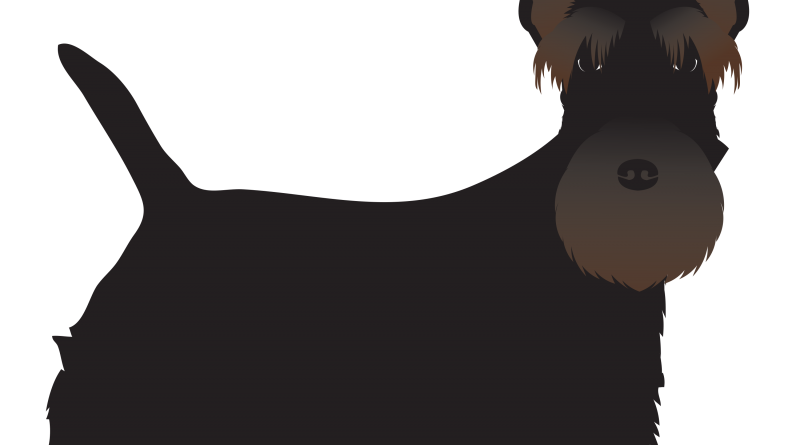 The Scottish Terrier is a great breed for those who want a small companion dog with plenty of character and an independent streak, and have time to train them consistently. Scotties are brimming with personality so sometimes can be a little stubborn! There are now a record-breaking 29 native vulnerable breeds and nine that are At Watch, which totals more than half of the country’s 57 native dog breeds. One of the reasons that native breeds are thought to be in decline is because they are being pushed out of favour by more fashionable choices. Breeds which have soared in popularity in recent years include the nation’s now most popular breed, the French Bulldog and the likes of the Dachshund. The new statistics show that the French Bulldog is now the most popular in the UK, surpassing the Labrador Retriever, which has been Britain’s favourite dog since 1990. 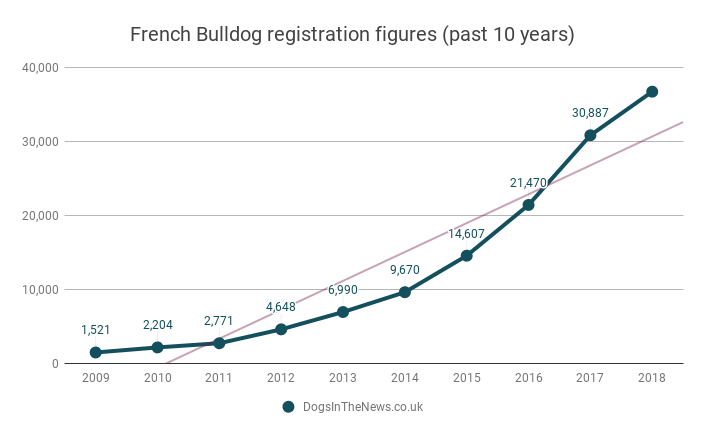 The French Bulldog has increased by over 3483 per cent in a decade, from 1025 registrations in 2008 to 36,785 registrations last year. The Miniature Smooth Haired Dachshund, which is now the ninth most popular dog in the country has soared by over 173 per cent in the past decade. 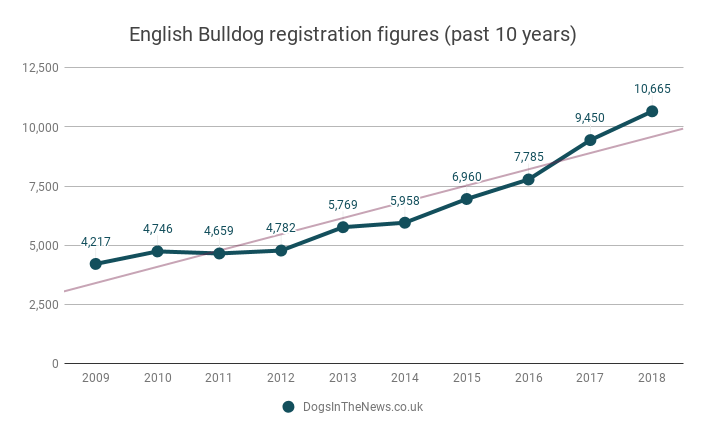 One British breed which has been affected by these trends is the (English) Bulldog, which has grown from around 4,000 registrations in 2009 to 10,665 in 2018. However, both the French and classic Bulldogs are known as a brachycephalic dog breeds, due to their short muzzles, and the Kennel Club and other welfare organisations are trying to raise awareness of the health issues that these breeds can experience. Caroline Kisko, Kennel Club Secretary, said: “There were just 24 vulnerable breeds and seven at watch a decade ago. There are now another six breeds either vulnerable or At Watch and we could lose even more of our most iconic and historic native dog breeds if people don’t look beyond the most obvious choices – such as the increasingly popular French Bulldog – and start to explore the huge diversity of breeds we’re lucky enough to have in this country. Alison Bloxham, Secretary of the Irish Red & White Setter Club of Great Britain, said: “Irish Red & White Setters are an ideal dog for an active family, and have a lot of love to give, but each year we see fewer registrations. It’s such a shame that some of our most historic breeds continue to drop in popularity and are at serious risk of dying out entirely.